I wrote this for an employee newsletter at AmeriFirst Home Mortgage. Our team members use social media to connect with home buyers and real estate agents alike. I thought sharing LinkedIn tips with them would be helpful. LinkedIn is a great place to connect with other professionals. Sure, it can be a place to go job hunting. But it’s also one of the best places to talk “industry” with business referral partners, possible employees and peers. It’s like going to business networking event…from the comfort of your home or office. 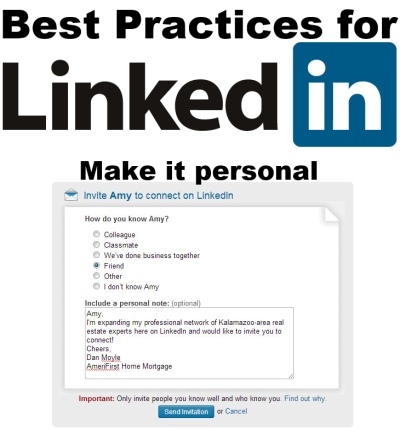 Since LinkedIn is a more professional atmosphere, it’s helpful to follow some best practices. Not only will this help you maintain a business profile, it will also help to grow your LinkedIn network – a goal of many of us in the referral-business world. Here are a few best practices for the LinkedIn crowd. Those of us using Facebook know the importance of using a picture. How many times have you received a friend request and wondered who the person is? That photo avatar helps us know faces. In Facebook, we often use photos from vacations, pictures of kids/pets or maybe a group photo with friends. That works fine for the personal crowd in general. Think of LinkedIn as an office. We tend to dress in business attire at work. We have certain manners and ways of interacting. We’re sober. Your LinkedIn profile should mirror this. Not only should you include a photo of yourself, but it should look somewhat professional and the person looking at it should be able to recognize you in person. Below are some examples of what not to use as a LinkedIn avatar (from real-life examples I’ve seen). In other words, use a photo of you in front of a fairly boring background like your office with a fichus tree behind you. Take the photo like a medium-close up (head to mid-chest or waist is good). Don’t pose like a police mugshot in front of a white or gray wall. The summary is where you tell a little of your story. Make this a first person narrative so the person reading it doesn’t feel like they’re reading an obituary. It’s up to you, but including a little about yourself personally is a nice addition. For instance, include something about a hobby. “Experience” is where you give your work history. Don’t be afraid to go way back in your history. You never know when a past experience will speak to a potential connection. For instance, someone I know will more likely hire a person who has experience in the food service industry, specifically as waitstaff. As you fill out your experience section, be sure to list facts like actual duties in the job, accomplishments and successes. Finally, include volunteer jobs and internships. Just because you didn’t get a paycheck, doesn’t mean it wasn’t a real job. LinkedIn groups are a great place to make connections. Join a local group, and take the relationship offline with networking events. Be active on group discussions by “liking” and commenting when you can. Just remember, it doesn’t really count when you just say “I like this” or “Good article.” Actually add something to the conversation in a respectful way. Discussions and comments can prove to be a great way to connect with people. Just make sure you’re not spamming the group. Vary the content and sources you’re posting, and spread it out rather than post a bunch of stuff all at once. Connecting with others is clearly the point of LinkedIn. Reach out to others in your area that might have something to share with you, and vice versa. Real estate agents, builders, home service professionals (decorating, plumbers, electricians) and other housing market professionals can be great connections. This entry was posted in Uncategorized on December 12, 2013 by danmoyle.